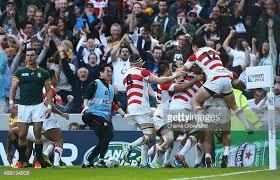 Japan’s players celebrate what may, perhaps, become the most famous try in rugby history. New Zealand 145-17 Japan. 1995. England 111-13 Uruguay. 2003. Australia 142-0 Namibia. 2003. The early days of each edition of rugby’s flagship tournaments have always provided the unwanted spectacle of lambs wilfully making their way to the slaughter. Since 1987, the IRB, world rugby’s governing body have –admittedly with a lot of persuasion- attempted to develop and grow the game, particularly in the non-traditional hotbeds of the sport. The game of course needs to be promoted and spread –otherwise you get a self-serving administrative set up like that of cricket’s power-brokers- but there have been occasions, like those listed above, where one almost wished there was a mercy rule. And so, we all tuned in, perhaps only semi-interestedly, to see by just how much Eddie Jones’ Japanese side would suffer at the hands of two time World Cup winners, South Africa. Two hours later, and with sitting-rooms, pubs and indeed, Cardiff, absolutely rapt, Karne Hesketh slid over in the corner to earn the most unexpected, though richly deserved, victory in rugby history. What happened in Brighton felt almost transcendental in its immediate aftermath –not of course that we would attach over importance to a game of rugby- and could well provide an incredibly-timed effect on the game of rugby in Japan, just four years before they host Asia’s inaugural Rugby World Cup. It is worth noting, however, that this result at least in the short term has probably had a far greater effect on established rugby playing nations than Japan itself –indeed the game was not even broadcast live there- but the hope is that such a momentous occasion will bear fruit in Japan in the next few years. This victory needs to be spoken of in a different context to anything else that happened last weekend. How, in all rationality, can one consider Ireland and France’s facile –though entirely functional and impressive in their own right- victories over Canada and Italy when over in the other corner an upset of genuinely seismic effect had occurred. This is not soccer, where the very style and physical requirements of the game facilitate upsets on a relatively regular basis. In rugby, the big sides –specifically the big three southern hemisphere sides- simply do not get caught out by some chippy upstart. The vagaries of the game mean that if a bigger side can’t find the key do the door, they’ll simply go straight through it. Just look at the circles in which these sides operate. Japan’s final pre- World Cup game was a defeat to the world superpower U.S. Eagles. South Africa, meanwhile, appeared to have turned the corner –the ‘Boks had lost their previous five- with an impressively, overpowering victory over Argentina in Buenos Aires. As the game kicked off, there was an underlying feeling that this duel would provide viewers with the sort of dispiriting turkey shoot –you’re probably the only rich person out there if you felt otherwise- that make casual fans wonder what’s so great about the early stages of this tournament. And then a to and fro epic unfurled before a Saturday afternoon crowd which must have been wondering right up until the final quarter whether this was simply going to be a case of the Japanese dam bursting as expected. Indeed, Eddie Jones, their masterfully innovative coach, implied as much as he too feared the horror movie was about to unfold. Japan’s last two tries, particularly taken in their context, are quite simply two of the best tries you will see over the next six weeks. The first, by Ayumu Goromaru was straight out of the school of Jones, a wonderfully crisp move off clean lineout ball, punctuated by a beautifully timed inside pass to breach the green line. The winner was impressive for multitudinous reasons. Eschewing kickable penalties to draw with you know, just South Africa, might seem fanciful for one of the stronger nations yet Japan’s players didn’t even contemplate the alternative. And there is no way that one could argue with their logic. Here they were, in an all all-time position to register the most amazingly shocking result in the history of a game that dates back to the nineteenth century. Never mind ‘The Catch’ or the ‘shot heard around the world’ from the grossly hyperbolic world of U.S. sports. Hesketh’s try and Japan’s Eddie Jones-inspired victory will reverberate in a way that nobody in their wildest dreams could have imagined. Japan have ensured that they will be treated with a level of respect which they surely could not have anticipated prior to Saturday’s miracle. The cruel nature of the schedule means qualification will still be a brutal struggle but confidence can’t be an issue now. Jones, ever witty, had this to say about upcoming opponent’s Scotland, “It’s interesting that before the tournament Scotland said we were going to tank the first game. So if we did tank the first game we’ve got a good performance coming up in our second.” Eddie Jones, sardonic to the end, sadly leaves his post after the tournament but hopefully not without adding to the greatest upset in rugby history. That said, with Japan now at eleventh in the world, a defeat against twelfth ranked Scotland would actually be an upset. See, the revolution has already commenced. David Kearney’s debut World Cup try capped an impressive, if expected, opening round victory over Canada. Outside of and before the beautiful insanity of the endgame in Brighton, Ireland set the ball rolling with a thoroughly efficient, injury-free performance over Canada. Having put the result beyond doubt during a riotous ten minutes against fourteen men, Joe Schmidt sagely removed the ‘Unbreakables’- insofar as if they get broken we’re screwed- of Sexton and Murray with more than a quarter of the game remaining. The obvious fillips from the game, aside from the half-backs increased sharpness, were the performances of Luke Fitzgerald, Keith Earls and the increasingly influential Iain Henderson. The former pair seem as though they have the ability to wreak tandem havoc on opposition defences, while the Ulsterman is impressively living up to and indeed surpassing the weighty pre-tournament expectations extolled upon him by the Irish public. Ireland will probably retain only two or three starters from last weekend for Sunday’s upcoming clash with Romania. The value of developing a squad –from a competitive and not lip-service point of view- will be on display on Sunday and assistant coach Les Kiss has indicated that most if not all of the thirty one man squad will have taken to the field after just two weekends of action. In this regard the coaching team will have fulfilled some obvious but vital requirements, ensuring competition is maintained in the squad while most importantly engendering a sense of unity within the group. Of course, there is nothing to suggest that spirit and togetherness are an issue with this squad but like Banquo’s ghost, the 2007 disaster still looms large in the Irish memory. So with one weekend down, the quite expectation remains and any lingering pre-tournament nerves should have subsided somewhat. While Japan have the chance to do something ludicrously, insanely impressive today Ireland will quietly be looking to make their statement to the world some weeks from now.